The rally in Crude Oil Brent off the January 2016 lows, just might turn out to be an impulsive formation. 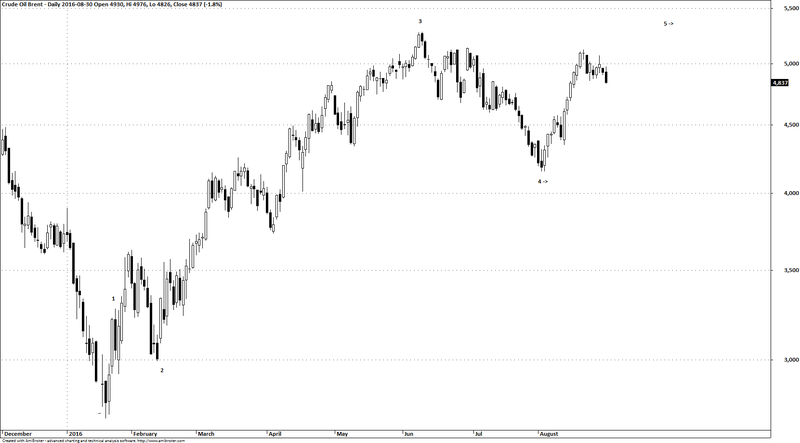 As inferred from the above chart, it is possible to view Crude Oil Brent, as being in wave 5 upwards. The support levels down at wave 4’s bottom are quite important, and the oil market does seem to be impulsively advancing in what could be wave 5. For now however, wave 4 might still be going on. 4th waves are generally hard to analyze, and often continue for longer than initially expected. The predictability of the oil market is definitely low for some time to come. If wave 5 does exceed the top of wave 3, that will entail long-term consequences. For instance, the low of January 2016 will then probably last for a very long time. It will also solidify our wave count in the monthly and weekly charts. A long-term bottom in crude oil will also hasten the end of at least some of the QE-like programs. Rising inflation in fuel prices, will hit what’s left of the poor and middle class, and cause social instability. Central bank manipulations have all been aimed at creating inflation (or at least, that’s what’s generally assumed to be the case…), but we might end up with uncontrolled inflation, which is another beast entirely. Sharply rising fuel and food prices will greatly decrease the space available for QE-like programs, and might indeed force liquidity draining measures. Please visit our Crude Oil Brent EWT analysis page, to learn more about our wave counts on the short-term and long-term.